What I need is a distraction. Something to take my mind off the Bravermans and Hank and his glasses. I need BOOKS. Okay this is good. A healthy realization. Okay. Help my soul. Tell me what you’re reading, and what I should most definitely read right this instant or else set myself on fire and call it day. What about Gillian Flynn’s other two books? Yay or nay? And if you don’t rightly give two toot-a-loots, let’s just talk about this super easy Pad Thai for a smidge. Oh man oh man. It’s light, it’s vegetarian, it’s bright, it’s sproutasprarian. (shhhh) Weeknight friendly and waistline happy. And nothin’ better than coming together in a snappy! Super Easy Pad Thai fer ya! I live under a rock, I've never had Pad Thai. Need to change that. I just finished "The Secret Keeper" by Kate Morton, best book I've read in a while. Waistline happy, I'm all into that, especially when it can taste this good! I LOVE pad thai...and your posts. Thanks for making my morning! seeing as i pretty much bawled through the entire last episode - i have my tissues at the ready this time. :) loooooove that show. and also your food! YUM. Love your posts! Gillian Flynn's other books are great, BUT, since you asked, and I know you like to be scared,go for F.G. Cottom! Dark Echo or Room of lost souls. Scary ghosts during the Jazz age . Oh, and totally gonna make today' s recipe! Discovered pad thai about a year ago. Can not eat enough of it! I think of all of those years I missed out. Thanks for the recipe now I can make it at home. And I am in the middle of catching up on Parenthood, love that show! I think all shows should be played in marathon format :) And this pad thai looks great!! UUuuugghhh! I forgot the trailer from last week made this week sound so juicy and now I have other plaaaannnnsss! Cursese upon me. I must know what Drew's gotten himself in to! It's been WAY too long since I've had pad thai. Bring on the easy version! This looks so good! Definitely putting the ingredients on my shopping list. And if you're looking for a good book, I just got done with Bob Goss's "Love Does"....so good! Lately I only catch Parenthood in random spurts. I need to go on a parenthood spre like you so I understand when I finally see it!! It's too bad I don't like pad thai. Or coffee. Or chocolate. Or steamed pork dumpling. Oh wait. Those are all my favorite things in life. Have you watched Homeland yet? The husband and I are almost done with season 2 now.. We watched the first 2 seasons in like 3 days. And now I have to face the realization that I am not a CIA asset. Sigh. I haven't watched Homeland yet but eeeeeeeeeveryone tells me I MUST! Because I AM a CIA asset, obvi. Such a fav in my house. Yum! I love the looks of this. Crisp, crunchy, healthy, delish! Ooh, pad thai and a book discussion -- two of my favorite things :) Right now I'm trying to get into the Winter Sea, which isn't super fast-paced, but I like the story. I also second a Kate Morton book, I'm planning to read her new one soon. Recently (besides Gone Girl ;) I've read Blackberry Winter and The Paris Wife, both of which I looooved. If you end up reading Gillian's other two books, please let us know what you think! And second I have to point out this recipe isn't vegetarian because it calls for fish sauce... but it does look super delish. Oh shoot you're so right! For some reason fish sauce and worcestershire sauce never register as NOT vegetarian. Ugh! Thank you for the heads up on that. And thaaaank you for the book suggestions! You cracked me up with your parenthesis incident. Ok, I just finished reading The Paris Wife and I loved it. Right now, I'm reading The Optimist's Daughter (classic Southern lit makes my world go 'round.) So does pad thai. 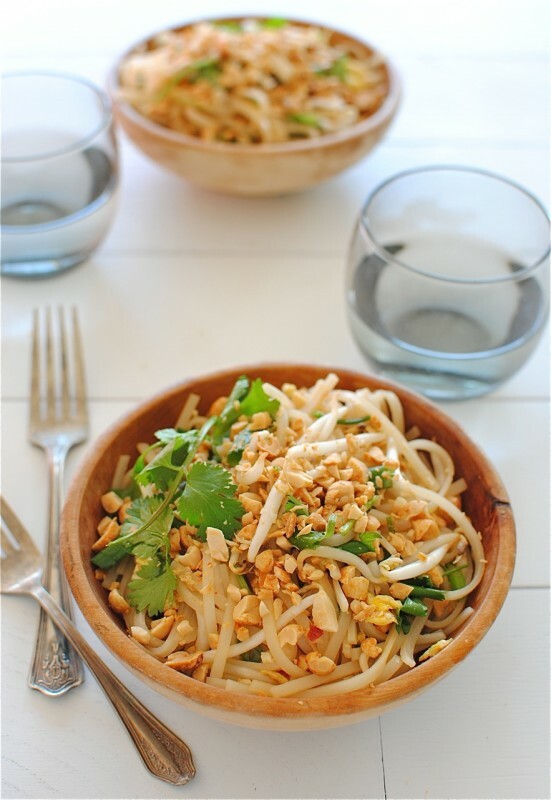 I'm a huge fan of Pad Thai - it's one of life's little bowls of heaven! That's the thing about binging on TV shows on Netflix er whatever: I friggin live love and breathe the show every day...until I get all caught up. It's the worst. Aaaaand now I want pad thai. Have you read the Violets of March?? Sooo good :) I'm like 90% finished and I can't put it down. I may even have read some at work today during my lunch break. Pretty sure I'm not supposed to do that. Woops. I just started season 3 of Parenthood LAST NIGHT and I already don't want it to end. I don't know what the heck I'm going to do when it's over. Also, have you read the Baker's Daughter? Loved it. Parenthood is so good. I started watching it this summer and am all caught up now. And how dare they make us wait an entire week (sometimes more!) between episodes! Love pad thai - order it almost every time we go for Thai food. Believe it or not I get milk delivered to my front door in glass bottles :) And I live only 45 minutes from Denver, CO in a town of 160,000 people. The time between episodes seems like FOREVER now. Pad Thai can definitely hold me over. Maybe. I have been in super busy mode once fall hit and I had 6 - yes 6 episodes of Parenthood piled up in the DVR...it was killing me. Just had my 1st nice calm uncommitted weekend...guess what I did. I savored every single moment...and like you now I feel like an addict needing my fix of the Bravermans! Yay! Pad Thai! I'm totally tearing this up some day soon. As for books, I'm reading the last book in the Game of Thrones series, and I loooooooooooooooooooooove them! They are huge, bulging books, but I think they are quick reads! Man, do I love Pad Thai. Now I'm craving it. I should probably learn to make it (going to check recipe). And wow on finishing Parenthood. I fell off during the holidays, but gearing back up for some marathons. I miss those people. I never want it to end! Have you watched Friday Night Lights? I'm obsessed with pad thai, but I kinda assumed it was too hard to make at home. I'm definitely trying this ASAP. I wanna make it to impress my girlfriends at our next dinner party. Thanks for the easy recipeasy! Do you watch Breaking Bad? We recently donated a week of our lives catching up on the first 5 seasons. Powerful. Bookwise, Oprah's selection, The Twelve Tribes of Hattie was money. I'm currently reading Ken Follett's Fall of Giants, book one of a trilogy. Delicious historical fiction. ohhhhhh sproutasprarian ... you little word ninja, you. It's okay for dudes to like Parenthood, right? Sometimes I think I should get annoyed with all of the crying, and I usually do with other shows, but I don't with Parenthood. Hopefully it's accepted and manly, otherwise just pretend I said "SportsCenter." Gillian Flynn's other two books are just as page-turning!! I really need to get on the Parenthood bandwagon! And yes for pad thai! Nothing beats the homemade version, right? I loved all three of Gillian Flynn's books. They are very different from one another, but good in their own way. Sharp Objects is a tad disturbing (didn't keep me from reading twice!). I hated the ending of Gone Girl!! Just stumbled across your blog when I searched for Pad Thai. I'm going to try the recipe and I will keep coming back, if nothing else than to hear from another adoring Parenthood fan! I still have the season finale to watch on DVR, but I feel I need to savor it since it will be a long winter, spring, and summer with out it!